પ્રયાગ... | મંઝીલ રહે, અનંત તુજ સંગ…!! મંઝીલ રહે, અનંત તુજ સંગ…!! The Himalayas were calling me as it was quite a long time since I trekked in Himalayas. 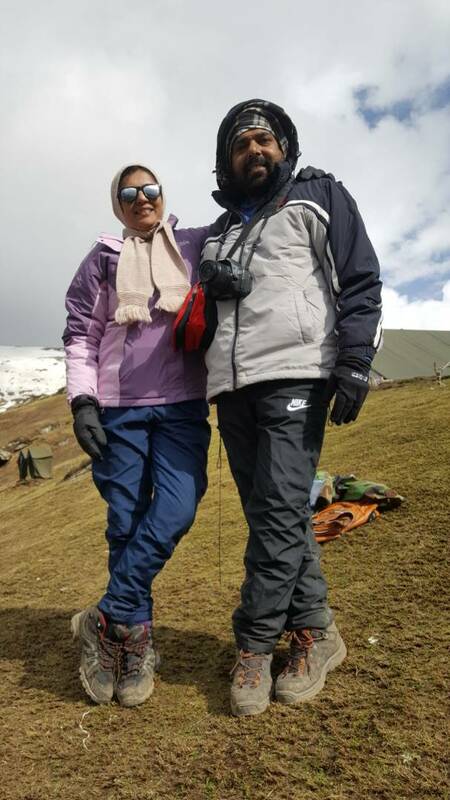 When I came to know that Mr. Vishnu Joshi had planned Sar pass trek, without thinking much Me and my wife joined it! There were 40 persons in our team. It was sleepless night when I came to know that I was senior most person(54 yrs) it our batch! Month before the departure, I made my morning-evening walks more regular to maintain the stamina for the trek. Two three days before departure, I purchased the necessary things from Decathlon (one of the world’s largest sporting goods retailers) budget was more than total tour cost! Day 1 : 25th May Thursday : Ahmadabad to Delhi by Flight We all 40 persons wear black T shirts and blue jeans. We were center of focus at airport. From delhi to Bhuntar It was semi-sleeper Volvo. Dinner at Punjabi Deluxe dhaba- Havelli. At 6.30 am, we boarded local bus from Bhuntar bus stand to Kasol.Bhuntar to Kasol is about 30 km and it takes about 1 to 1 ½ hours by bus. At 9.00 am, reporting at YHAI base camp at Kasol. It was approximately 60 feet below the road level. The temporary stairs made of rough stone led us to the reception of the base camp. There are constructed toilets and bathrooms. There was a big area for orientation meetings, camp fire etc. 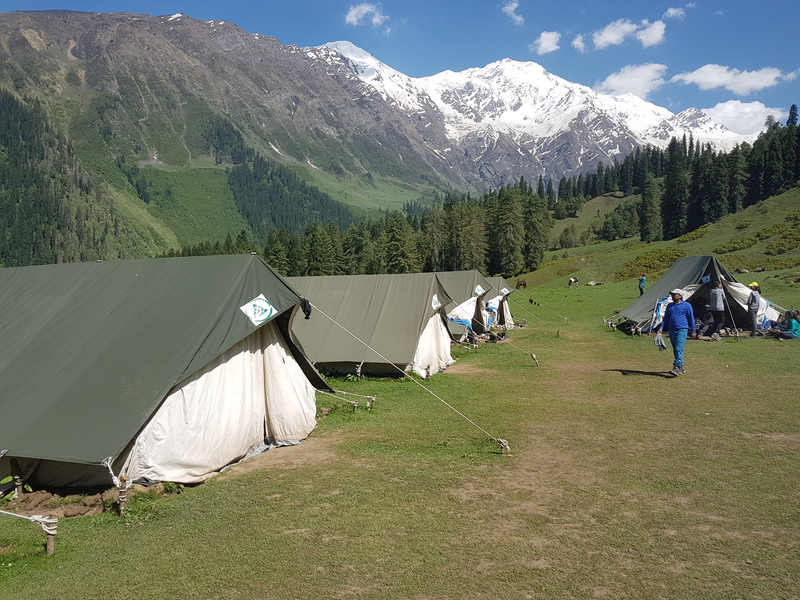 There were rows of tents on both sides for our batch, batch reported 1 day and 2 days before us , batch ready to leave for Sar pass and batch came back from Sar pass. At 3 pm, there was orientation lecture for the SP-22 group by the Field Director They gave us useful tips about the whole trek: what to wear, what to take up with us in our rucksack in the trek, what are the obstacles and difficulties we may face during trek, etc. After the orientation, we were being issued the rucksack, one blanket and one inner sheet. At 8 pm, camp fire was organized without using wood- fire! Bournvita was served after camp fire. Acclimatization walk in the morning. The morning bed tea was served at 5 am. 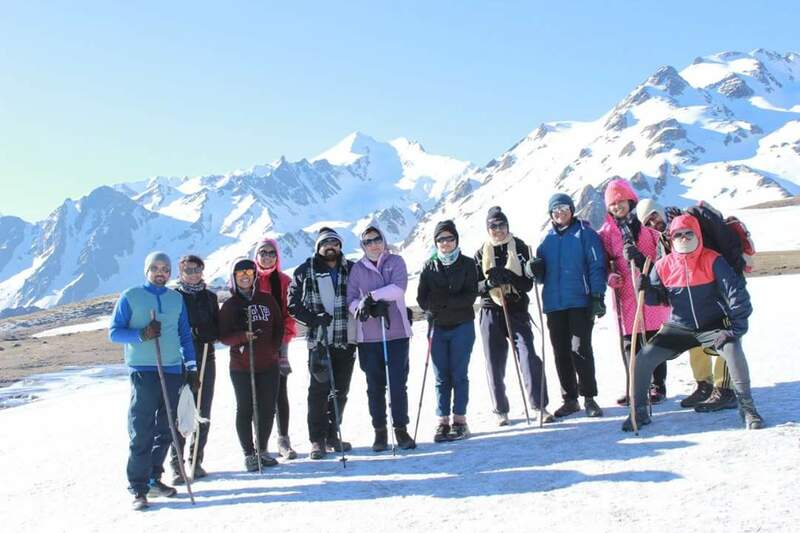 All participants of SP-22 and SP-23 assembled in the campus area of base camp at 5.30 am and walked about 1 km to a ground for morning exercises. At 7.30 am, we returned to the base camp. At 8.15 am, participants of SP-22 and SP-21 lined up to see off and cheer members of SP-20 group who were leaving base camp for Sarpass. At 9 am, we walked to nearby jungle rock climbing and rappling. After lunch, at about 2 pm, we again went to the same spot, this time for Rappling. Rappling is an exercise by which a person descends down a rock using rope and devices. The same three instructors conducted this session. After the rappling session was over, at about 4.30 pm, we all roamed in the market. We took bath in hot spring at Forest department restroom. Few bought rain coat. At late ecening We packed essential items and one extra pair of clothings in the rucksack and deposited the remaining extra luggage in the cloak room at base camp. More the weight, the more the strain and unease during Sar pass trekking. We all woke up at 6 am in the base camp and deposited the blankets and sleeping bag. Then we all took breakfast. At 8 am, we all members of SP-22 assembled in the campus area. We were total 69 (50 boys, 19 girls). 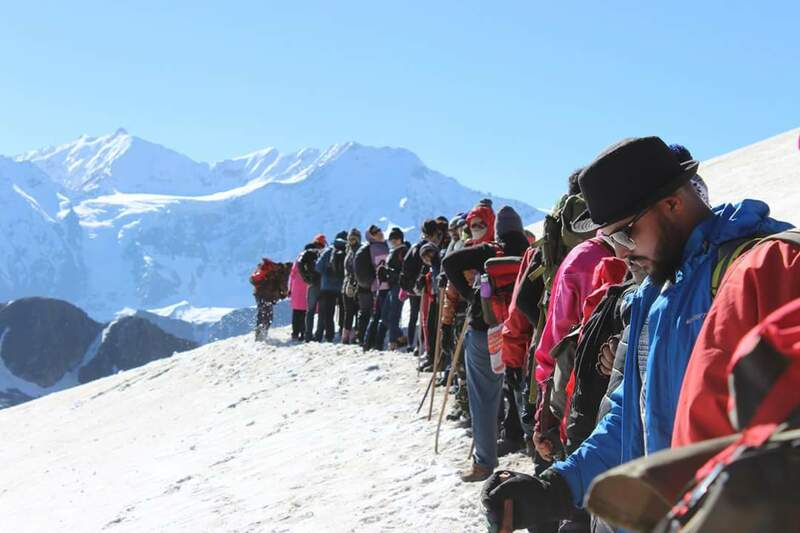 At 8.30 am, the members of SP-23 and SP-24 along with camp leaders and Field director at base camp cheered us while we walked out in line to go to the higher camps. All members were given a packet of dry fruits. It has become sort of customary for the members to devise a slogan for their respective groups. Our group members had made the slogan “ Khuch khutch khachhar khachhar, hu ha hu ha”. 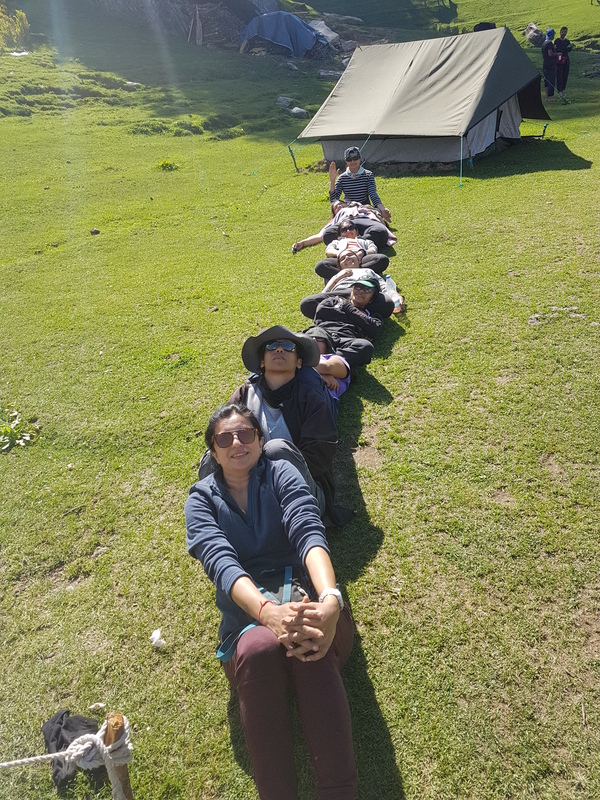 One thing remarkable about our group was that almost all were youngsters and more than 80% were first time trekkers. Infact, I happened to the 2nd oldest member of the group after Mr Ramanathan 62 yrs. Youngest one was 13 yrs girl. Mr Dolar was 110 kg (second time Sarpass climber). It was an up and down journey from Kasol to Grahan. 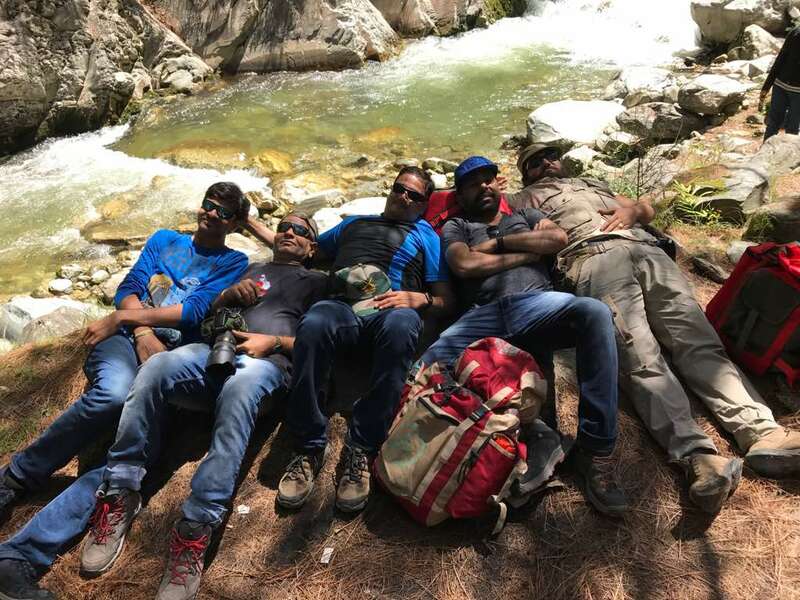 We rested at few points. After crossing two wooden bridges, we rested for about 20 minutes at a point. At about 1 pm, we all sat at a point and took packed lunch. At lunch point wanders were selling egg, omelets, Maggie and packed foods like chips, frootie, cold drinks etc. After walking for about 1 km from lunch point, we had to climb up the mountain through the jungle. The climb became steeper and steeper in the last about two km took us to Village Grahan. We passed through the village.There were now so many Home Stays(paid guest- guest houses in the village. Our camp was far away from the village. 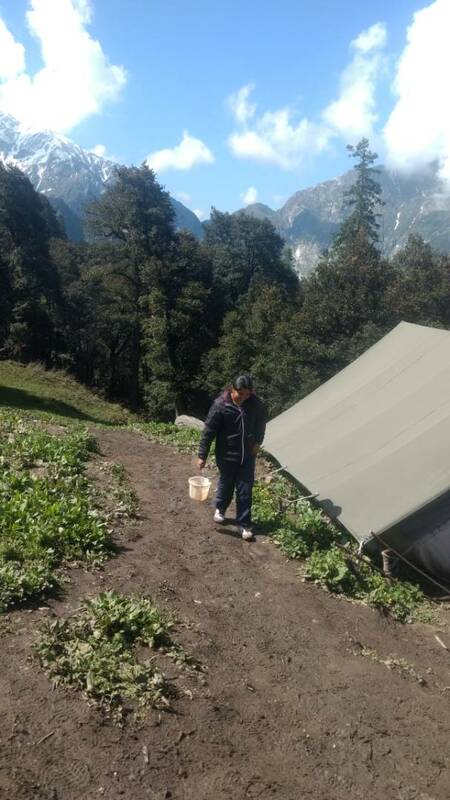 At 4.00 pm, we reached the Grahan camp which was at an altitude of 7700 ft. Grahan is small village situated deep inside the Parvati velley tributaries. We were welcomed by the camp leaders at village only. They gave us the necessary instructions about the timings for tea, dinner, camp fire, morning tea, breakfast, packed lunch and departure next morning. He warned us not to enter temple or prayer zone of local village. They also informed about the separate toilet areas for boys and girls. (Indian toilet 3 feet by 3 feet made up of tent material). The water for washing vessels, toilet use as well as drinking was same through pipe, drawn from a spring. On arrival in the camp, we were offered welcome drink rasana. Then after half an hour, we were offered delicious soup. The dinner was served at 7 pm. Then, the camp leader provided one sleeping bag and one blanket to each member. The local villager offered canteen near our campsite. At 8 pm, members sat out in open and played Antakshari-(sang songs). Bournvita was served at 9 pm. The sky was very clear and was full of stars. 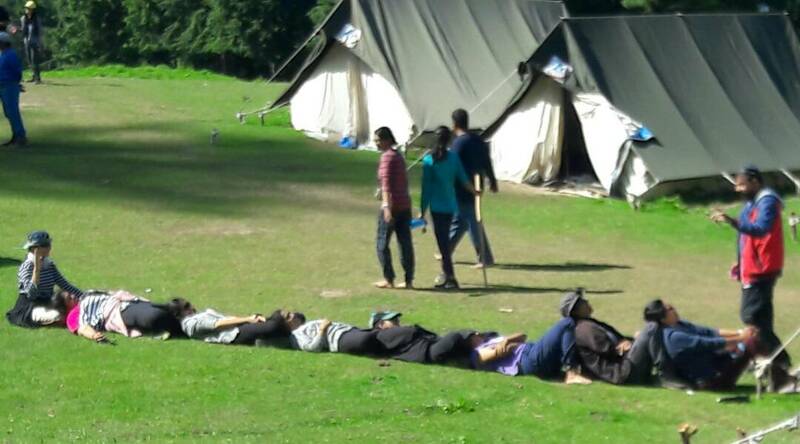 We 13 persons slept in one tent with all luggage and shoes! There was no electricity or mobile signal in our camp. I got up at 5 am without any alarm. There was bed T ready. The breakfast was served. We returned back the sleeping bag and blankets. Later on packed lunch was provided. At 10,00 am, we all assembled, we were late due to long useless lecture of the camp leader. We all moved for the next higher camp. 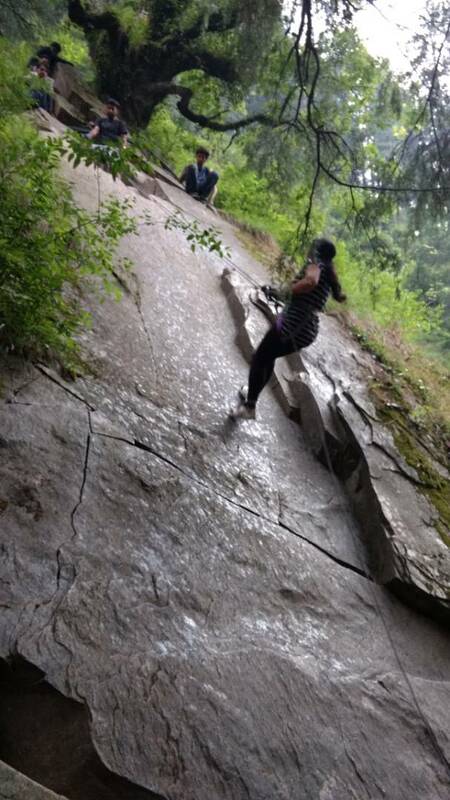 For about 1 ½ km, we had to go down till the water stream-Nala. It was painful thought that we were supposed to climb it all again. From here, it was up and up. Now the ascent was quite steep. We rested at one place, there was a water stream from where all filled up their bottles At lunch point stall was put up by a Grahan villager. All took packed lunch there. We rested at lunch point. At 1.30 pm, we started from Lunch point. A 30 minute walk from lunch point we all excited to see the first glacier of snow. After an hour walk we came across the YHAI banner of Padri camp. Padri Camp is situated at an altitude of 9300 ft. It was raining and we walked about 45 minutes in rain to reach the camp site. It is one of the best camp site surrounded by snow covered mountains.. A natural stream of water was passing by the side of our camp. The herds of cows were grazing in the field and were trying to enter our tent. We were welcomed by the camp leader. We all lined up and counting was done(as usual procedure). The weather was sunny and clear. We were blessed by god to have such clear weather. We were served with tea and peanuts. The camp leader informed us to be aware of Bear and cow at night while visiting toilet at night. He advised to go out of tent (for toilet) with atleast two person together Dinner was served early as there was no electricity at camp. which includes dal, subzi, rice, roti, papad and kheer. The sleeping bag and blanket were issued There was no electricity and no mobile signal at Padri camp. We got up at 5.00 am. We utilized Indian toilet for nature’s call. It was little difficult to stands up from squat position at Indian toilet. The route was steep climb. After breakfast at 7.45 am, packed lunch (aloo (dry) subzi and roti) was provided. At 8.10 am, we started from the Padri camp. We went down and down upto the water stream-nalla. The path was slippery. We then again trekked up. At 2 pm, we reached lunch point. We climbed fairly steep. Today’s trek was the toughest and lengthiest. At 5 pm, we reached the Ming thatch camp, which is at an altitude of 11,200 ft. We were welcomed by the Camp and served with hot tea. At 6 pm, soup was served. At 7 pm, dinner and at 8 pm, bournvita was served. The milky way was clearly visible. There is no electricity here but the some mobile catches the signals. Day 7 : 31st May 2014 Saturday : Ming Thatch to Nagaru. Trek 5 hrs. Altitude 12500 feet. 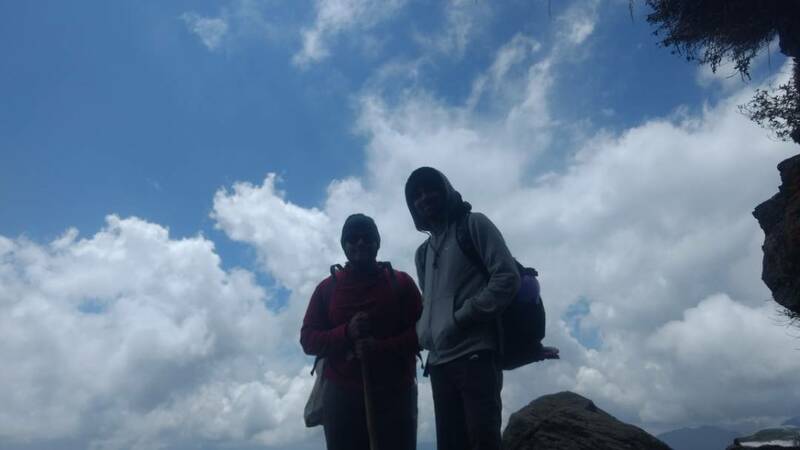 At 4 pm, we reached Nagaru camp, which is at an altitude of 12,300 ft. We were welcomed by the Camp leader. Camp leader informed us regarding last night heavy snow fall. Very good quality sleeping bags with blanket were provided. After It little windy there. it became sunny and we all came out, for photography. Group leader pointed one place where mobile signal were available. Most of all were busy to communicate with their relatives on their mobiles! At 4.30 pm, tomato soup was served. At night Nagaru became too cold and chilling. We pray to holly Nadaru God at camp. No one was allow to wear shoe at Nagaru Temple area. Delicious hot gulabjambun served with the dinner. At 8 pm, we all went to the sleep. Today was the longest part of our trek, running into 14 km. 12-14 hrs trek and most of the trek was tough. We woke up at 2.00 am. The weather was very good and supportive.We returned the sleeping bags and blankets. 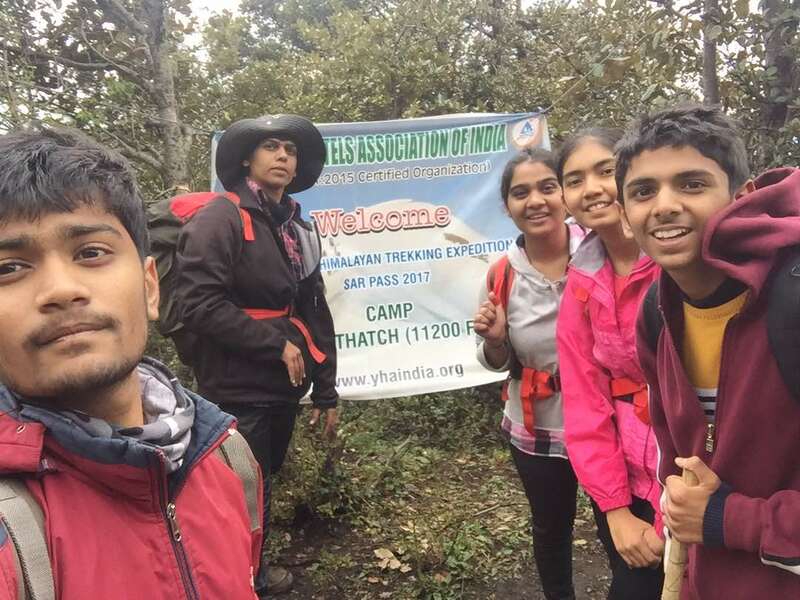 After three hours of walking at about 8:15 am, we reached Sar Pass, which is at an altitude of 13800 ft. We all enjoyed photography. 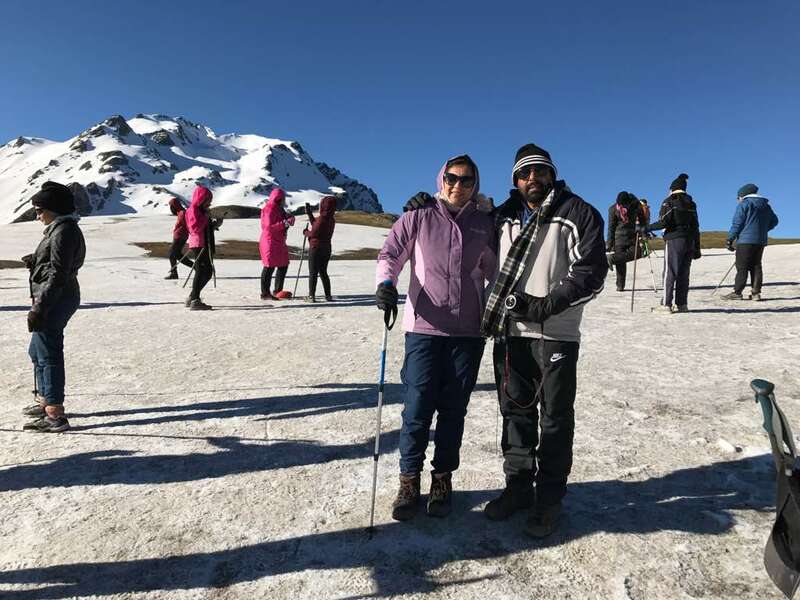 We walk for several hours in snow to reached a point which is called Biskeri top. This is the highest point after Sar Pass. 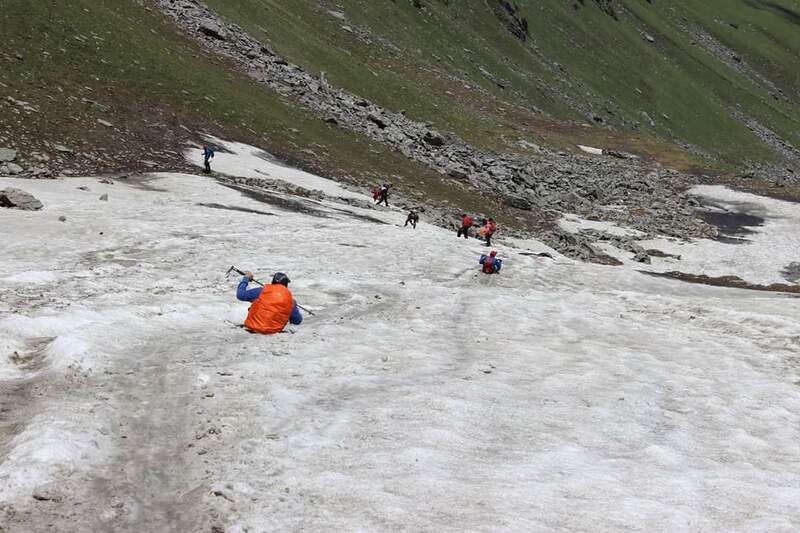 It is at a height of 13500 ft. From Biskeri top, there was a long slide down the hill in snow. We sat down on top with our rucksack on our shoulder and then started sliding down. Snow was not enough. We could slide hardly ½ km. Rest part we were supposed to walk. It was most tired some part of journey to reach up to lunch point. 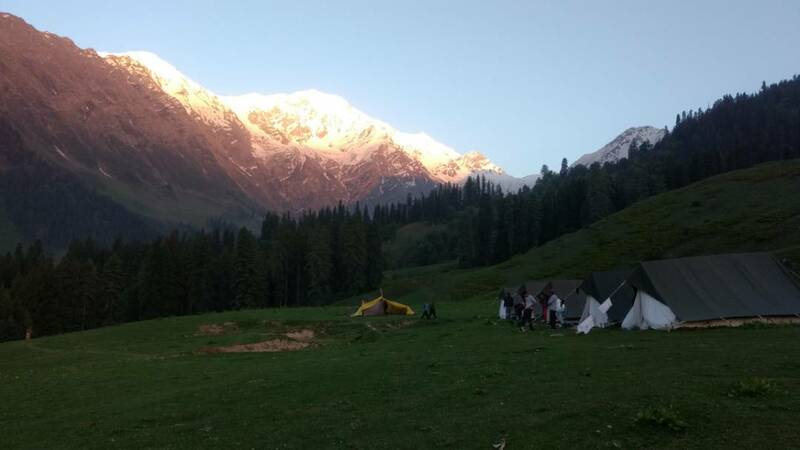 At evening we reached Biskeri camp, which is at an altitude of 11000 ft. The camp leader welcome us. We changed the clothes. Tea and Pakora were served. Followed by hot soup was served. After lunch we all slept early. At 7.15 am, I woke up by rays of the sun. It was holiday feelings. We were out of schedule today. At 10.15 am, we started from the Biskeri camp. It was a steep descent all the way for 2 hours upto the lunch point. After some time, we climbed down through terrace stepping in the fields. Last 40 minutes were a steep climbing of about 60 degrees which was really strenuous, after so many hours of descent. 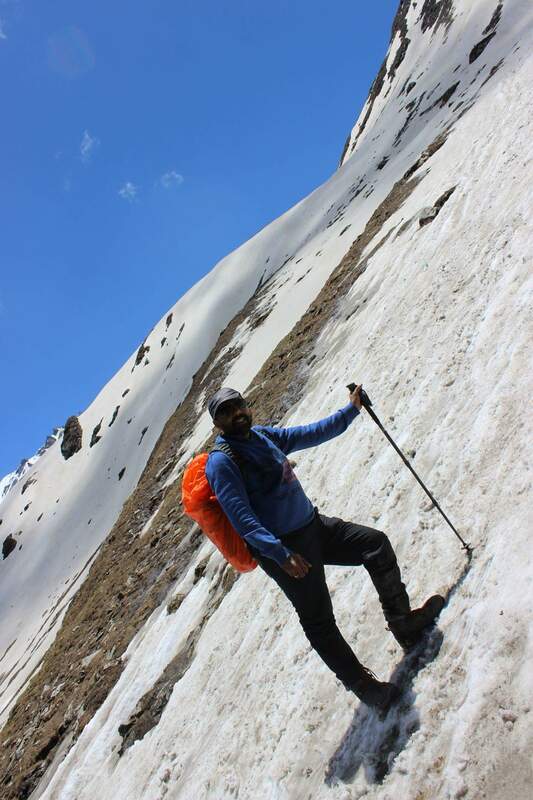 At 5.00 pm, we reached the next camp Bandak Thatch, which is at an altitude of 9000 ft. It turned out to be the most beautiful camp site. It is also called the Switzerland grass land of India. We played cricket after welcome drink and soup. We woke up at 6 am. At 7.15 am, the breakfast was served which comprised parantha, pickle and tea. No packed lunch was given today. Dr. Bharat Makwana sent you an image file! ‘ધ સન્ડે ઇન્ડિયન’ ના આ અંક મા પ્રસિદ્ધ થયેલ મારી લઘુ વાર્તા..
દારૂ ન પીવે તે ગધેડો કહેવાય! કુદરતના બે વરવા રૂપ -અતિવૃષ્ટિ-અનાવૃષ્ટિ. K.J.T. પર મારી પહેલી છંદ્સ રચના….